A deal is a potential business opportunity. It's a lead you're still negotiating with a potential client and nothing is signed yet. There is still no project to work on, so you're still in the sales phase. Leads - you put here all the deals that could potentially turn into a project. Whether its a RFP someone sent to your e-mail or an idea you're pitching to an existing client, this the first step in a deal lifecycle. 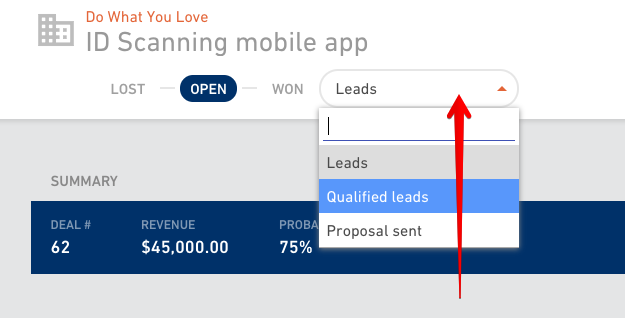 Qualified leads - this are the leads you decide to take to the next level - whether you arranged a call with a client to discuss the requirements, or you invested some time in preparing a pitch, a qualified lead is something you see a potential in. Proposal sent - once you prepare and send a proposal to a client, you can transfer a deal from Leads to Proposal sent status. Now you wait for the client feedback. If all goes well a client will agree to your proposal and you'll be winning a deal. This is just an example and you can always customize your own sales in settings. If you want to move a deal from one status to another, open the deal page by clicking on a deal and select a new status from the drop down menu. If you prefer a list layout over a column layout switch easily between the two. 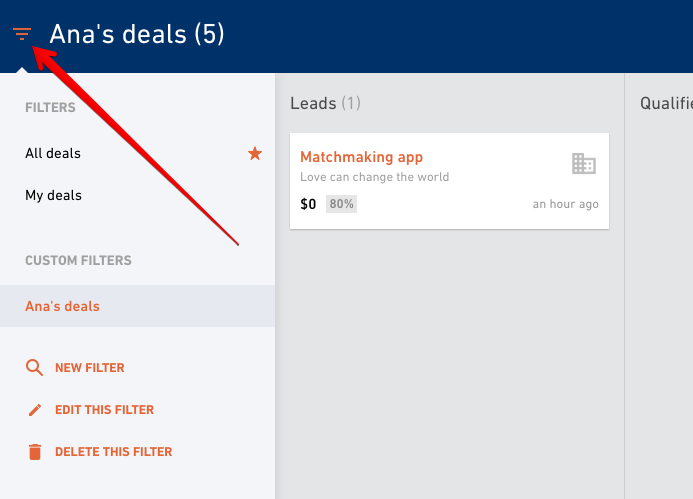 You can also use the filters on the left to manage your deals more efficiently.